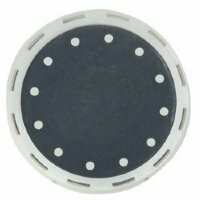 EDI PermaCap 5 diffusers feature a high-strength ABS body with NPT(M) connections. The EPDM membrane is locked in place with an engineered retaining ring to prevent blowout. EDI PermaCap 5 diffusers offer increased air capacity and greater oxygen transfer. The coarse bubble operates at rates up to 20 cfm.